You’ve just moved in a brand-new home, which is exciting, but now you’re faced with many bare windows—which is not the best choice when decorating a room. Window treatments can help soften the look of the room, and they’ll help control light, provide privacy, and even add energy efficiency at the window. At Treasure Coast Window Fashions here in West Palm Beach, we offer the entire line of Hunter Douglas window fashions, and we will be more than happy to help you treat your new windows the way they deserve. Contact one of our professionals today. Choosing the type of treatment your room needs is the first order of business. Soft Roman Shades. If you are looking for something luxurious but without yards of flowing fabric, a Roman shade is a great choice. When closed, the shade is a flat fabric panel. When raised, the cascading horizontal folds have a clean, tidy look. A Roman shade can be mounted inside or outside a window frame. 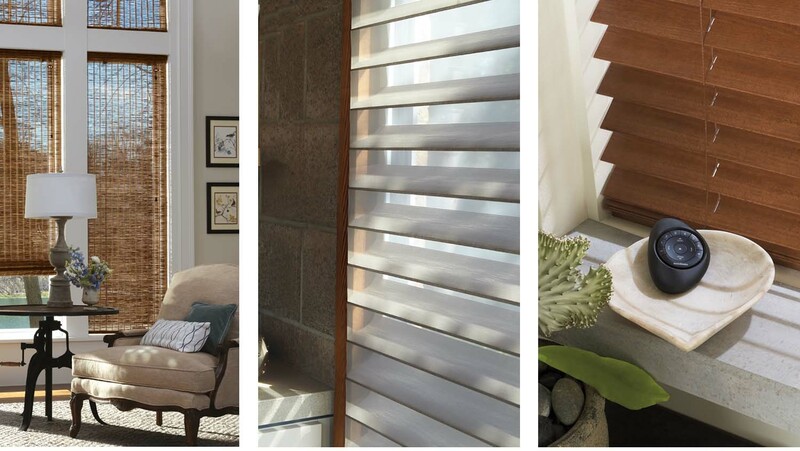 Consider the Vignette® Modern Roman Shades or the Design Studio™ Roman Shades by Hunter Douglas. Sheer Shades. Sheer shading includes soft vertical vanes that seem to float in the window. This type of treatment is formal and soft and works well with contemporary décor. Take a look Hunter Douglas Silhouette® window shadings or Pirouette® window shadings, and for the bedrooms and your home office, consider the Nantucket™ window shades, which are very cost-effective. Shutters. Plantation shutters are fantastic—they’re clean, long-lasting window treatments. There are no cords, so they are safe for children and pets. They let in a lot of light when opened and provide “lights-out” darkness for a good night’s sleep. Also, shutters are easy to clean and do a great job of providing insulation from the outside cold and heat. Consider Heritance® hardwood shutters, NewStyle® hybrid shutters, and Palm Beach™ Polysatin™ shutters. Hunter Douglas offers a variety of lift systems, from standard manual operations to motorized systems. They all offer pet and child safety, and some offer more. UltraGlide® is a retractable cord system that lets you raise and lower your shades with no ugly, dangling external cords. LiteRise® is a cordless system that lets you gently raise and lower your shades with slight pressure from your hand. PowerView® motorization is a wireless operating system that can be used with a PowerView® Pebble® remote or with your mobile device or tablet, even if you’re not at home.